Finn is a dragon shifter and a firefighter. Who better to fight fires than a dragon shifter? He's the leader of the firefighter enforcers who are kind of like police for dragons in their territory. He's been hurt and even though he wants to find his destined mate, he's not willing to take a chance that the female might be killed in the process. Delaney is running from a stalker as well as mysterious fires. So when she wakes up and yet another mysterious fire is blazing around her, she decides to take the help from the firefighters who saved her. Finn doesn't want to get too close to Delaney because he's not willing to risk his heart or her life but the sparks fly between these two and it's hard for them to stay away from one another. Finn and Delaney get along right away, there was just this great chemistry between them. So it wasn't a huge leap when they couldn't keep their hands from one another. Finn and his enforcers find out that a guy is stalking Delaney and putting her life as well as her friends life in danger so they step in to protect her even though they don't think she's a dragon mate. Finn is very protective of her and she gets along with all the enforcers and that's a good thing since she's staying at their headquarters while they track down the stalker. While trying to find the stalker and keep her safe, a lot of information comes to light, a lot of twists happen and a couple interesting people pop up that I'm sure we'll be seeing in upcoming books. I found this story so much fun! 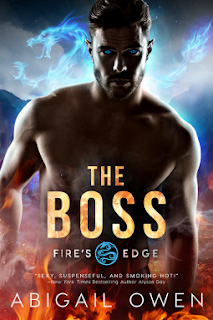 What's more fun than a dragon shifter romance that makes you laugh at times? I had a great time with this and am looking forward to reading all of the enforcers books. I read and reviewed this book before edits were made so my copy may be different from the one you read now. Disclosure: I voluntarily read and reviewed an advanced copy of this book via NetGalley. All thoughts and opinions are my own.